This will be the last recipe I share for over a week as I am travelling back to London, but it is a good ‘un; really tasty and colourful. It was a bit of a ‘what do we have in the cupboards’. 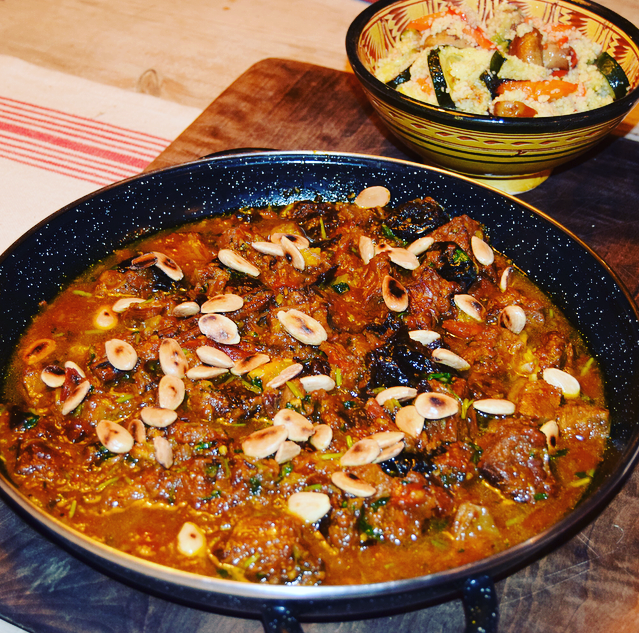 We had bought some beef and prunes, and at my Aunts request she wanted a Moroccan tagine. There were a few oranges left on the trees so I thought I would incorporate them. I love cooking Moroccan food, as it is very similar to Indian flavours and spices, I love to work with spices. This is sweet and aromatic; I will definitely be making this one again. 500g Beef chunks, stewing beef or braising is good. Dry fry the coriander seeds then crush. Melt a good knob of butter and some olive oil in a pan, then add the sliced onions and cook until soft and slightly browning. Add the garlic, I let these slices get a little browned too. Add the chilli, ginger, cinnamon, cloves, cardamom seeds, turmeric and coriander seeds and mix well. Season the beef well, then add to the pan. Coat in the onions and spices. Let the beef brown, then add the zest of one orange and the saffron and stir. Then add the juice of half an orange. Keep the flesh of one orange as we will add this later. Mix well, then pour in enough water to cover the meat. Cover with a lid and pop into a pre-heated oven at 200 degrees and cook for 45 minutes to an hour, or until the beef is tender. Once tender, remove the lid and stir in the honey, prunes (I chopped any large prunes in half) and segments of an orange. Stir and pop back into the oven, uncovered for another 15-20 minutes. You want the sauce to reduce. Then stir in the fresh coriander. Roast the almonds in a dry frying pan and sprinkle over the top of the dish before serving. I served with some buttery roasted vegetable couscous.